So, I downloaded the LearnMMD Stage from the Downloads page … What do I do with it? How do I dress the LearnMMD stage? The stage is brightly colored, can I tone it down? Are there instructions for using the LearnMMD Stage? What do I do with all of those curtains that are included with the LearnMMD Stage? 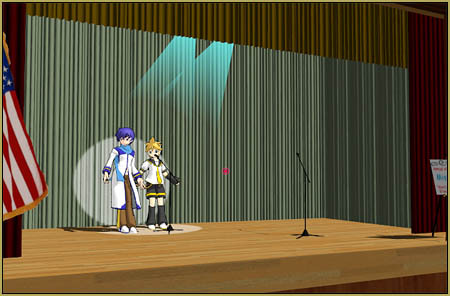 Our LearnMMD Stage set gets downloaded about 30 times a week! … yet I rarely see it on YouTube. I figured I’d write some instructions to help you dress the LearnMMD Stage. First … set the Background to Black; this keeps the “white” from shining through around the foot of the curtains at the back of the stage. The Stage has bright red curtains. As shown in this picture, it can over-power your scene. The most simple way to tame that bright red is to move the overhead lights until that glare goes away. I have made a bunch of videos using this stage … and the red drapes work well as long as you adjust your light positions to dull the bright red. The other way to get away from the red drapes … is to cover them with any of the extra drapes included with your download. A bunch of different colors of curtains are included with your stage. This picture shows a few of them. Many are reversible with a second color on the flip-side. 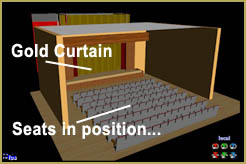 To dress the stage in new curtains, LOAD the curtain of your choice several times. 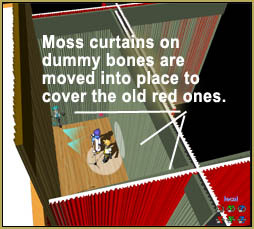 Attach each one to a different dummy bone … and use the bones to maneuver each curtain into place on your stage … put it just a hair this-side of the old Red Curtain, to hide the red one. Above is the stage dressed with the Moss-colored curtains … the change in color makes it look like a different stage! 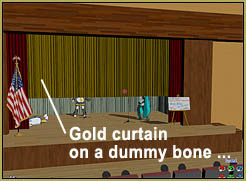 This image shows the same stage as seen from above … you can see how those new drapes simply cover the old ones … you put one in back and another one on each side of the stage. These pictures also show another feature that works well … I use the Floorlights accessory both on the floor … and on the curtain wall. To make it stick to the wall, I attach the Floorlight to a dummy bone … and then move that light disc into place, upright against the curtains. Along with those floorlights, I use the colored “light03_b” lights, attached to dummy bones … moved up into the overhead to shine down as if they are the source of those floorlights. You can pivot them to follow any of the moving floorlights that you might create as you follow your model onstage. 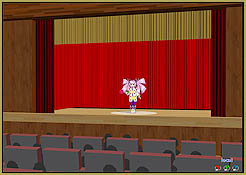 The LearnMMD Stage comes with the theater seats as a separate piece. You attach it to a dummy bone and move it out into the room … and set it where you want it. The seats were created as a separate model to allow a bit of flexibility in their positioning. You can put the front row of seats right up front … or leave some floor-space in front of the front row so someone can stand there to introduce the show! You can set the stage with the rest of your accessory/props. I have a flag, an easel, some microphones … potted plants, tables, chairs … you name it! See how the props and the floorlights … and those overhead lights … make the scene come alive. 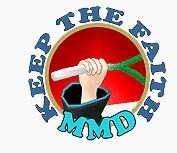 Get your LearnMMD Stage from the LearnMMD Downloads page.